It always seems to be the way – those who know least about a situation usually have the strongest opinions on it. That certainly seems the case for US attitudes towards the Ukraine crisis – according to a study performed by a couple of social scientists (see The less Americans know about Ukraine’s location, the more they want U.S. to intervene). 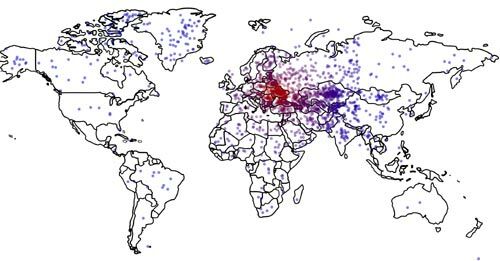 The dots on the above map are the responses to the question “where is Ukraine?” found by the study. Perhaps the poor understanding of world geography is not that surprising. But the worrying thing is that the more mistaken the responders were in their answer the more definite they were that the US should take military action in Ukraine! That’s a bit of a worry. This entry was posted in politics, SciBlogs and tagged SciBlogs, Ukraine, USA. Bookmark the permalink. It’s all very well for the article/study in the link to go on about geographical ignorance but the authors don’t or won’t differentiate between America and USA. USA constantly appropriating the title of America and speaking for America speaks volumes about their collective arrogance as well as their geographical ignorance. It’s one of my pet peeves.